The 2013-2014 Mercedes-Benz C-Class is the best-selling Mercedes model around the globe, and it’s also one of the safest luxury vehicles in the world. The Mercedes-Benz C-Class is truly a global luxury car that will keep you safe. It has just received a “Superior” rating from IIHS for its high level of safety in front crash protection. There were only seven vehicles out of 74 cars and SUVs tested that scored this high. Over 10 million Mercedes-Benz C-Class cars have been delivered to customers around the globe and the 2014 C-Class is now the most popular car in the premium segment. Part of the reason for the luxury cars success is it’s innovative safety systems. The C-Class scored five points out of a possible six and was one of the top cars in the new IIHS safety crash test. But it's just one of the many safety features on the popular Mercedes model. One of Mercedes safety systems that the C-Class uses is called DISTRONIC PLUS. It’s a driver assistance system which combines automatic speed regulation with proximity control in relation to a vehicle traveling in front. It uses an automated response using advanced radar sensors vigilantly scanning traffic ahead for stopped or slowing traffic. It utilizes a PRE-SAFE Brake feature that automatically initiates up to 40% braking power and audibly alerts the driver. 100% braking pressure is instantly applied when the driver touches the brakes. Other safety innovations on the C-Class include: Lane Keeping Assist, which alerts the driver by simulating rumble strip vibration in the steering wheel if the car drifts from its lane without the turn signals on. The system operates at speeds above 37 mph via a system that recognizes lane markings, via a small camera in the windshield and a computer that analyzes the video images. Another safety innovation on the C-Class is called Blind Spot Assist, which monitors both blind spots behind and to the side of the luxury vehicle. Whenever a turn signal is activated with a vehicle in the blind spot, the driver gets visual and audible warnings to warn of the close proximity of the vehicle. Additionally the C-Class comes with Adaptive Highbeam Assist that uses a small video camera to sense both headlights and taillights, then softly and automatically transitions between high and low beam operation to avoid blinding other drivers. With this system, the range of the headlights can be varied infinitely from their current 220 feet to up to 1,000 feet. To round out the incredible safety of the C-Class, it also uses Night View Assist PLUS that uses an infra-red camera in the windshield and displays reflected images. This assists the driver in seeing pedestrians up to 300 feet earlier than before. They are seen as highly detailed black & white video images in the instrument cluster. It uses two beams mounted in the headlights and extends the driver's ability to see ahead to nearly 500 feet. 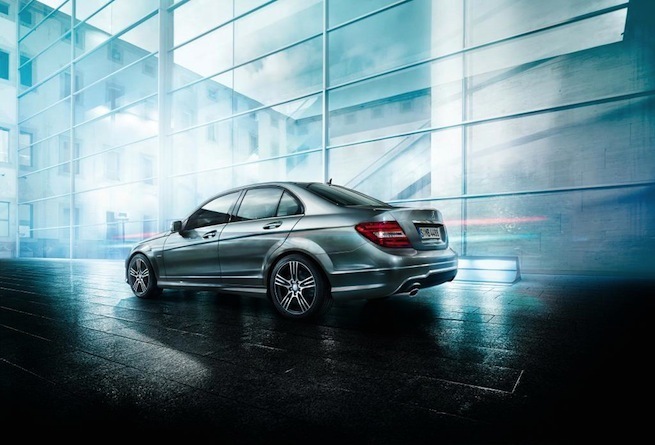 The 2013-2014 Mercedes-Benz C-Class is one of the safest luxury vehicles on the planet. It’s no wonder its Mercedes’ best-selling model around the globe.